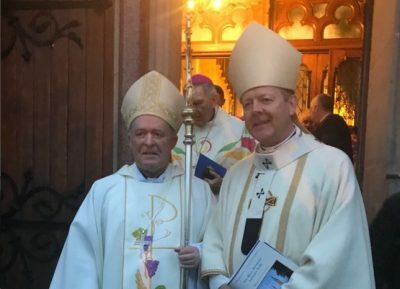 Ireland’s newest bishop, Larry Duffy of Clogher (left) with Ireland’s most senior bishop, Archbishop Eamon Martin of Armagh, at Monaghan Cathedral yesterday. Forty-three years after he was ordained a priest, Msgr Larry Duffy stepped forward on to the altar at St Macartan’s Cathedral in Monaghan yesterday to be ordained a second time, this time as Bishop of Clogher. In his homily at the Mass of Consecration, Archbishop Eamon Martin of Armagh, primate of All Ireland, described the call to be a bishop as a “call within a call”, a phrase used by Saint Mother Teresa to describe the overwhelming desire that suddenly came upon her to leave her teaching role in the Loreto order to establish a new congregation, the Missionaries of Charity, working among the poorest members of society. “To become bishop is your ‘call within a call’,” said Archbishop Martin, addressing Ireland’s newest bishop. “But do not lose your priestly and pastoral instinct to serve, and to build up hearts. This is one of your gifts and you can bring it to your episcopacy. Your choice of episcopal motto – ‘God is Love’ – is simple, yet profound and challenging. The cathedral was packed for the ceremony. In addition to 26 members of the Church hierarchy, also present were Clogher diocesan clergy and religious, former seminary colleagues and priests from the Diocese of Kitui in Kenya where Bishop Duffy, 67, served as a missionary for four years, plus many well-wishers from civic and public society and those who had formed bonds of friendship with the Ballybay man over the years. Archbishop Martin told them: “The Holy Spirit is constantly building up and rejuvenating the Church. This is not a time for us to yearn for, or mourn for, a bygone era, but to prepare and till the soil for the new springtime. Archbishop Martin said he prays every day for vocations to the priesthood and religious life. “But I also pray that every member of the Church – married or single, ordained or consecrated – will realise that they are called by the Sacraments of Baptism and Confirmation to be part of the new springtime for the faith.